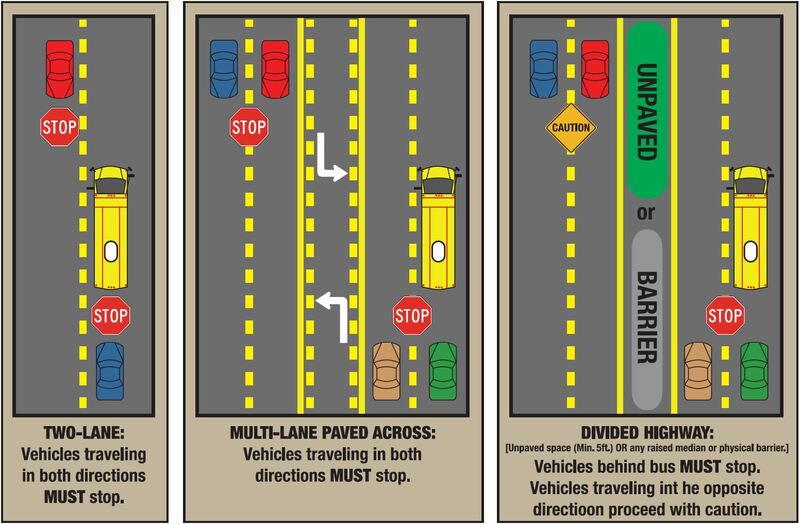 Florida — With the start of the 2015-2016 school year quickly approaching, here is a reminder for all of those drivers who do not seem to understand when to stop for a school bus. The Florida Department of Highway Safety and Motor Vehicles provided Ocala Post with the exact laws and, just short of drawing it in crayon, a full color diagram. Officials said if drivers do not understand the regulations after reading the law and reviewing the diagram, then that person should consider visiting a driver testing center. On a two way street or highway, all drivers moving in either direction must stop for a stopped school bus which is picking up or dropping off children. You must remain stopped until all children are clear of the roadway and the bus’ stop arm is withdrawn. If the highway is divided by a raised barrier or an unpaved median at least five feet wide, you do not have to stop if you are moving in the opposite direction of the bus. Painted lines or pavement markings are not considered barriers. You must always stop if you are moving in the same direction as the bus and you must remain stopped until the bus’ stop arm is withdrawn. Any person using, operating, or driving a vehicle that passes a school bus on the side that children enter and exit when the school bus displays a stopped signal commits a moving violation and will be required to complete a basic driver improvement course. School area signs advise drivers of school zones and school crossings. School zones help protect the safety of students when they cross the roadway. School crossings help inform drivers that children use that crossing to go to and from school. Be attentive to school zone reduced speed limits, school crossing guards, and unpredictable children, since these situations may require you to reduce your speed or stop. When children (walking, bicycling or skating) or school crossing guards are present in a crosswalk, drivers must yield or stop at the marked stop line and without stopping in the crosswalk. It is the driver’s responsibility to avoid colliding with pedestrians. Do your part to make every school crossing a safe crossing for children. Crossing guards are the first to enter and last to exit a crosswalk to indicate to drivers that pedestrians, especially children, are about to cross or are crossing. Do not enter the crosswalk while a school crossing guard is in the roadway. For more information, visit http://www.flhsmv.gov/.